When Jay Sperling went to have pre-operative bloodwork done for a minor knee surgery, he hadn’t anticipated the results. His white blood cell count was abnormally high. He didn’t have any infections (which can often cause the white cell count to go up), so his orthopedist sent him to an oncologist. Within a few days, that doctor’s conclusions were very clear: Jay had chronic lymphocytic leukemia (CLL). In 2002, the prognosis for this blood cancer was pretty bleak. Treatment options were limited and often had significant downsides to them. Jay and his wife Alice understood this was a serious diagnosis and that great challenges were ahead of them. Within a very short period of time, Alice got to work researching CLL. “It was a way for me to channel my anxiety. I was panic stricken when he got diagnosed. [Researching] was a way to have something to do.” And from that point forward, Alice became Jay’s personal care manager. Jay and Alice live in a quiet town in Oregon about 90 minutes south of Portland. Jay is a retired writer. Alice, who used to run a center for teaching and learning, now spends her time doing facilitation work, bird watching and being creative in her mosaic studio. Both enjoy hiking and travelling. For the first decade of Jay’s illness, their ability to engage in these activities was significantly curtailed, because the management of CLL took a lot of time and energy. Because of recent new treatment options that have been working for Jay, they have been able to return to doing more of what brings them joy. 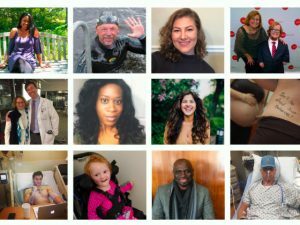 Join Health Stories Project and you’ll be automatically entered into our sweepstakes! Members receive information about our upcoming projects. We’re giving away $500 in prizes. No purchase necessary. Click to read the official rules. 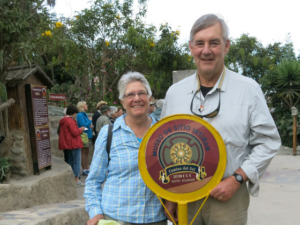 At the time Jay was first diagnosed with CLL, he was not experiencing any symptoms. The local oncologist whom he was seeing recommended watchful waiting without any active treatment, which was the acceptable approach at that time. Jay remained asymptomatic for seven years. Since CLL treatment options were still limited and only intermittently effective, Jay decided to join a clinical trial. 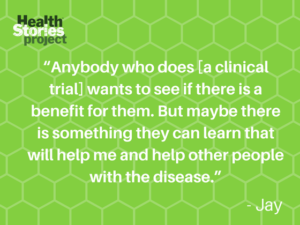 “Anybody who does this wants to see if there is a benefit for them”, Jay reflected on why he went this route, “But maybe there is something they can learn that will help me and help other people with the disease.” His first research study experience was a bust. After a relatively short period of time, the FDA determined that the test drug was not effective and they closed down the trial. When he and Alice returned from a trip they had taken to visit one of their daughters in New Zealand in 2009, he knew this period of disease dormancy was over. Jay started to experience extreme fatigue and, as soon as he got his lab results back, he found that his white cell count had significantly increased. His local oncologist recommended the next step, which was a standard drug combination called FCR (made up of the chemotherapy agents fludarabine and cyclophosphamide, and a monoclonal antibody, rituximab). This “elixir” started working for Jay and continued to do so for two years, when he started to experience fatigue and night sweats again, the telltale signs of a CLL relapse (return of active/progressing disease). They decided to try moving his CLL treatment care to Oregon Health Sciences University in Portland, seeking to prepare Jay for a stem cell transplant. Although Alice’s research told her and Jay that this transplant wasn’t necessarily the magic bullet, they decided to move forward with it. Unfortunately, the regimen Jay received as part of this preparatory process (bendamustine and rituximab) damaged his bone marrow and made the transplant impossible. Jay and Alice turned back to their local oncologist for help, but he had no further treatment options to offer. These limitations were not a result of this provider’s skill level, but more about what they could or couldn’t offer in a small, relatively rural practice. With his disease worsening, Jay and Alice were under pressure to find a new care route. This time, they turned to a CLL specialist, Dr. Jeff Sharman, who was based in Springfield, a larger town about an hour away from their home. They felt fortunate to find a nationally known CLL expert so close to home. They have never regretted making this choice. Almost immediately, Dr. Sharman’s team started to work with Jay to improve the state of his bone marrow enough to qualify him for a new clinical trial. “My numbers were really bad”, Jay remembered. Unfortunately, this trial drug was found to be ineffective. But moving to the newly-FDA-approved drug Ofatumumab for six months gave Jay’s bone marrow what it needed to improve. Jay then got the green light to join a clinical trial for yet another drug designed to treat relapsed CLL, entospletinib. It put him into remission for over four years. He had very few side effects and felt well for much of this time. However, in mid-2017, Jay’s CLL relapsed again. “Nobody ever thought the drug would last forever and it didn’t”, Jay stated. Jay’s most recent regimen is Ibrutinib. This drug is an even more recently FDA-approved medication for treating CLL (approved in 2015). His lab values are headed in the right direction again and he has good energy. When Jay and Alice talk about CLL to other people, they describe it as a chronic illness. Between all of the knowledge they have acquired about CLL since 2002 and the treatment advances, they feel much calmer about this disease than they did when Jaya was first diagnosed. While it used to be something that they talked about on a regular basis, and that dominated their logistic planning, it has become a far less frequent topic of conversation both between the two of them as well as with their family and friends. Alice continues to keep herself and Jay informed about new CLL developments. She says she reads at least three new articles per day, which she receives from many listservs to which she belongs (including CLL Society, Patient Power, CLLSLL@groups.io, LymphomaHub.com and CLL Automatic Digest). When she sees something that she thinks Jay should know about, she passes it on to him. Alice also discusses her online findings with Dr. Sharman, who has great appreciation and respect for Alice’s role in Jay’s care. Don’t do this thing alone. Have you been affected by CLL or another health condition? We want to hear from you! 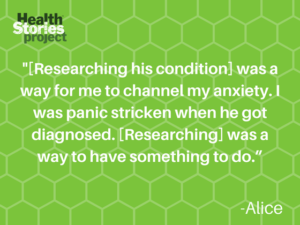 Sign up to share your experiences with Health Stories Project. Susan has been a health research professional for more than 20 years, both in the United States and in Sub-Saharan Africa. She is an extrovert who feels lucky to have found a career in which she gets paid to talk to people. 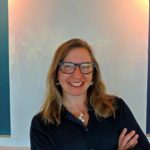 Susan is firmly committed to using her training and experience in behavioral science and public health to help people obtain health care that makes them feel physically and emotionally better.